CatherineBorn 3:41pm7lbs 11 1/2 oz We call her Catie Bug for short, she is so cute! Everyone, I would like to let you know that Christine and I are having a baby!!!!!!!!!! We are officially 10 weeks and 3 days into this wonderous event. 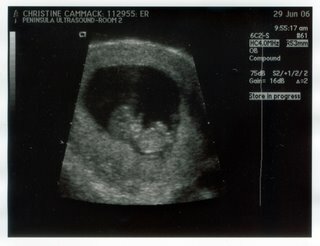 Here are some pictures and even the babies heartbeat! Hear the baby with your RealAudio Player! !